This year, cherry blossoms are expected to bloom 4 - 7 days earlier than average. 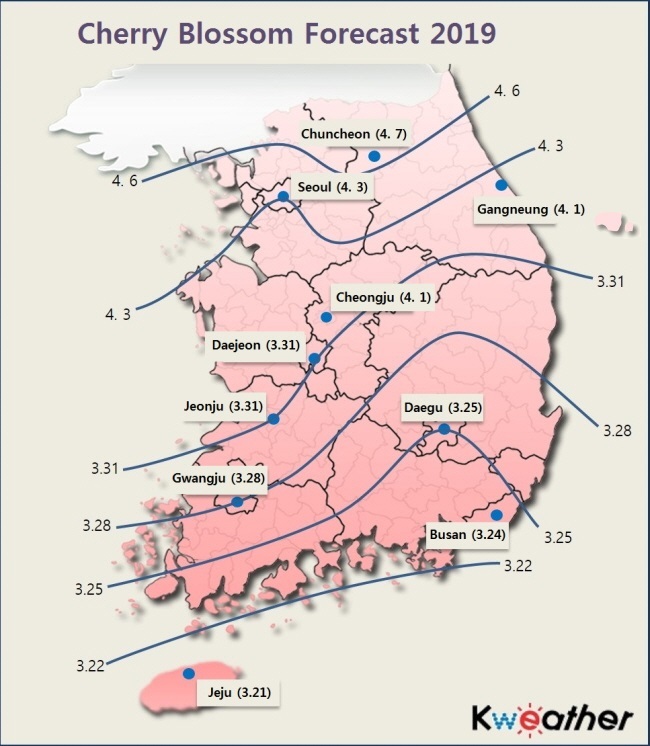 According to Kweather, Jeju-do will see the first cherry blossoms around March 21. Cherry blossoms will bloom in Busan, Gwangju, Jeonju, Daegu and other southern regions around March 22 - 31, and reach Seoul, Incheon, Daejeon and other central regions around March 31 – April 7. Korea’s representative cherry blossom festivals, such as Yeongdeungpo Yeouido Spring Flower Festival and Jeju Cherry Blossom Festival, are held around March and April every year. For detailed information about the festival, please check the official website for updates. With temperature rising, blooming period for other flowers has also sped up. In the same Rosales category as cherry blossom, the plum blossoms, maehwa in Korean, will bloom earlier this year. Representative maehwa festival, Gwangyang International Maehwa Festival, will be held from March 8 – 17, while Ttangkkeut Maehwa Festival in Haenam will be held from March 16 – 17.